5 Stars / Short Stories / Stevenson, Robert Louis / Thrawn Janet / Tuesday Terror! Old Reverend Murdoch Soulis is minister of Balweary in the Vale of Dule. Outwardly severe and composed, his eye is ‘wild, scared and uncertain’ and he seems to see the terrors that may lie ahead in eternity. Once a year, on the 17th August, he preaches a sermon on ‘the devil as a roaring lion’ that terrifies all who hear it, frightening the children into fits. 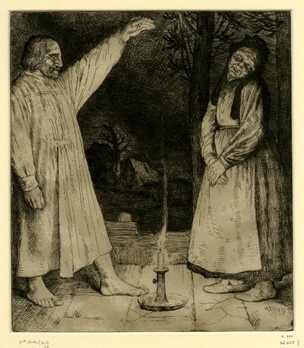 Both Reverend Soulis and the manse where he lives alone and untended are surrounded by an atmosphere of terror…and sometimes one of the older folk in the village can be persuaded to tell the old story that made them so…the tale of 17th August 1712…the tale of Thrawn Janet. It was before the days o’ the moderates – weary fa’ them; but ill things are like guid – they baith come bit by bit, a pickle at a time; and there were folk even then that said the Lord had left the college professors to there ain devices, an’ the lads that went to study wi’ them wad hae done mair and better sittin’ in a peat-bog, like their forbears of the persecution, wi’ a Bible under their oxter and a speerit o’ prayer in their heart. The beginning of this story is written in fairly standard English, but once the old villager takes over the narration it changes to a broad Scots dialect, much of which is now so archaic even I had some difficulties with the occasional word or phrase, so I feel a bit self-indulgent in picking it for this week’s horror slot. But this really is a classic horror story, based solidly in the witchcraft superstitions that lasted well into the eighteenth century in Scotland. Although the dialect makes the story a bit difficult to read, it’s worth the effort – it’s amazingly well written and really demands to be read aloud to get the full effect of the speech patterns and rhythms. He lay an’ he tummled; the gude, caller bed that he got into brunt his very banes; whiles he slept, and whiles he waukened; whiles he heard the time o’ nicht, and whiles a tyke yowlin’ up the muir, as if somebody was deid; whiles he thocht he heard bogles claverin’ in his lug, an’ whiles he saw spunkies in the room. He behoved, he judged, to be sick; an’ sick he was – little he jaloosed the sickness. You can find a very good reading of the story on youtube courtesy of the Association for Scottish Literary Studies – click here to listen. book review, horror, robert louis stevenson, scottish fiction, thrawn janet, tuesday terror! Now Twisted Janet is an interest. I mean, that’s highly creative. A great review, FEF! But I bet you struggled reading it more than you’re letting on! It is kind of a different language, though heavily based on English. And this is probably the best written version I’ve come across. Thanks, C-W-W! But funnily enough I didn’t find it difficult once I started reading it out loud, though it looks hard on the page. Just the occasional word I didn’t understand at all. But I love the rhythms in old Scots…it’s like poetry. It looks as if it’d be neatio to read. Do you write in that at all? No, though it’s a sort of garbled version I use when I jokingly write in Scots. But I couldn’t write anything in it properly, though I mostly can read it OK. I still think it’s coolio. FictionFan – Oh, I know just what you mean about stories that are best told aloud. This one certainly sounds like one of them. And what a rich sense of atmosphere too! I’ll admit I had to read a few things you shared twice to be sure I understood, but I can see how the whole story would be wroth reading. Please! Do an audio recording for us! I’m too shy. Why not get Schwarzy to do it, dadblameit?! You know–I bet you’ll think I’m nuts–I was very nervous about using my voice in the beginning. I bet Schwarz couldn’t read it! I can understand that – I hate hearing my voice on recordings – it just doesn’t sound like me at all, at least not to me. Urghhh! Oh…fooey, then! I’ll convince you one day that it’s coolio. And that baseball hats are neat. Yes, only the professor is dull enough! *laughing* Please don’t jump!! Tomorrow’s Friday!! I can fly, you know. It sounds like you, so just listen to yourself and you’ll know. It does not! BUS told me such a thing doesn’t exist. *laughing lots* Oh no… I’ll never outlive this, huh? Never trust anything BUS says – she’s unpredictable. I’m between a rock and a tree. Can I please be the tree? Remind me – was it a rock that made your head sore? *nods and laughs* Tell me, is that why you chose the tree? Oh, I think you’re quite safe! Sounds like the way I feel when I read something in American Southern Dialect. So much easier to understand when read out loud. Your cats KNOW you’re nuts! Great review. It’s one of my great regrets about Stevenson that he didn’t write more in Scots – I suppose English widened his market .Living where I do, I hear Scots spoken every day, using very many of the words which we now call dialect, and further North, in the Mearns country their are plenty of folk who still speak almost as broadly among themselves. I’ve always liked this story, and your review did it justice. It’s a shame there’s not more written in Scots all round, but since we’re not allowed to speak or read it in school…I think as well as the market thing, writers were persuaded that writing in Scots made them look uneducated in the post-Union world. Well, even in our day how often were we told to ‘speak properly’ if we slipped into slang or dialect? ‘Tis a sorry affair when a lass is no allowed ta speak her native dialect. 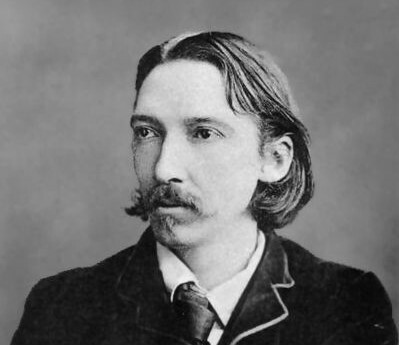 I picked up a bit of the lilt (in my head) when I was reading George MacDonald’s novels. A body canna know a people without understandin’ their language. I love Stevenson’s works. He draws me in from children’s poems right on through. I’ve not read this one, however, and methinks I must rectify that. ‘Tis indeed! It’s one of the things that we lost when we joined the UK – suddenly the Scots language was considered to be slang and we were all discouraged from speaking it much less writing it. Whatever happens with the independence referendum, at least it’s making us Scots pay more attention to our own heritage. I’m ashamed to say I haven’t read as much RLS as I should have – just the best known novels. But I really must find the time to remedy that…somehow! So many of the old writers were. It’s only recently that they get stuck in one genre and never allowed to try anything else. That is unfortunate. I remember the first time I read The Strange Case of Dr Jekyll and Mr Hyde. I was around 11 years old and it gave me such delicious chills. Yes, it’s a good one. If only there were time to fit in some re-reads amongst all the new stuff! Thanks for that link. I’ve added a link to the youtube reading to the main body of my review, and look forward to listening to the other readings. I love the fact a lot of children’s books are now available in Scots; hopefully this is just the start of people being encouraged to use their native tongue more. My Dad – who’s from further north – uses words like “thrawn” (to mean stubborn), “boorach” (untidy/messy), and “sklooter” (messing around or playing with water) every day. Are they? I didn’t know that, but I”m glad to hear it – the language will die out completely soon if we don’t work to keep it alive. I still use thrawn myself but I haven’t heard the other ones. Every different region seems to have its own variations…. Glad you enjoyed it! 🙂 I’d be glad if a few more adult books were written in Scots too, but one author did write a historical fiction about Robert the Bruce using a lot of dialect, and got absolutely slated by all his non-Scottish fans. So he went back to fairly standard English in the next one…disappointing. I’m not a fan of short stories, preferring lengthy tomes, but I’ve always loved this story. The Scots dialect is amazingly descriptive and the story does make chills run down one’s spine. I challenge anyone to read it alone, late at night and not be scared! It really is well done, isn’t it? I love the Scots dialect though I can see why it might be hard for non-Scots (or young Scots) to understand. I find reading it aloud helps, or listening to one of the reading of it on youtube. Definitely a scary one!